Olxam » BSNL JE » BSNL 2016 Application – TTA (JE). Apply Online Now! 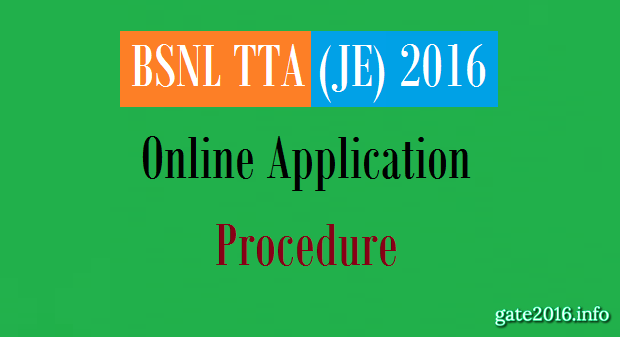 BSNL 2016 Application – TTA (JE). Apply Online Now! An open competitive examination for Junior Engineer (JE) recruitment for the various circles all over India will be conduct by BSNL (Bharat Sanchar Nigam Limited). BSNL will commence examination at all India level at nearly 25 exam centres. The number of vacancies to be filled on the basis of results of the Junior Engineer (JE) would be 2700 for the year 2016. 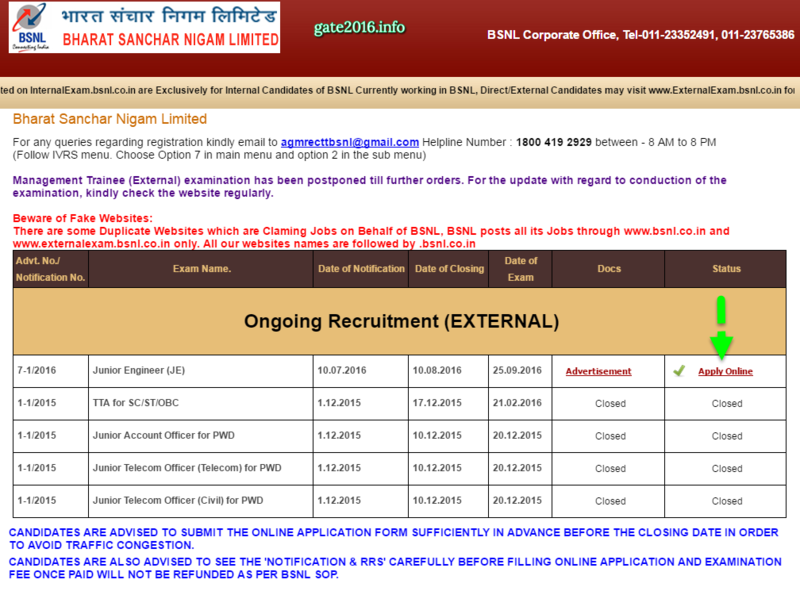 Submission of Application : Junior Engineer (JE) in BSNL applications can be filled in online mode only. what if i want to change my center of examination? can i fill it again or can change it? hi sir..i have completed my b.e.eee and i hav applied for bsnl tta exam..while applying i have uploaded only my 12th mark…bcz i cant upload all the other certificates..is tat way wat i hav applied s right…r else wat kind of remedy have to undergo to correct my application form..
i have been completed degree B.E in instrumentation branch.shall i apply for JE post? Dear sir/mam I’m Nikhil Mishra, I have 3 queries hope you will clarify it. My 1st query is that what is percentage % criteria for B.E. I mean aggregate required. My 2nd query is that I’m June 2016 passout in BE (ENTC) but I have 2 backlogs currently, and I will reappear in NOV and my result will come in FEB 2017. So what will happen if I’ve got selected and my result is pending and can I eligible for applications form which is on 25th SEPT. And my 3rd query is when the result of BSNL JE post will come, I mean any rough idea about that like in 2017 or before. Please kindly reply my all listed queries and help me to sort out things. And if possible kindly suggest me some tips and tricks for getting selected. And finally what is the official website for registration(link). Thanks Yours regard. my marksheet contain only grade and cgpa only..then how to i fill up the form(total marks obtained)…even i fill my percentage but (%) symbol cannot working. First of all thanks for this wonderful job that you are doing. I have converted my cgpa into percentage.my cgpa is 6.52 and after conversion it becomes 65.20.so I have filed 65.20 in the place of total marks.is this OK or is there any problem. Sir please tell me that in BSNL TTA JE form i have to upload only BE final semester marksheet or all 8 semester marksheet. please guide me. i am studying my btech 4th year 1st semester am i eligible to write the bsnl je exam and if yes then what should i enter in the date of result publishing ? hello sir what should upload in age proof? Sir, i have completed my degree in e&c. In the enter marks section do i have to fill marks of final year or the overall aggregate? 2.in graduation block which marks to be filled? final year marks or over all aggregate? but there is options for both of them so which is to select? sir my final result is expected to be declared by july ,but in the meanwhile i have filled the 1st step of bsnl tta registration form .so can i save the form till 1st step and fill the other details after the declaration of result?In one of your comment you told that bsnl saves the time of our 1st step registration and date of final year result declaration should be before that time.Is this true? I have completed B.E(ECE) and while filling form, there is third part “SPECILIZATION”. Do we need to study all the topic (irrespective of given stream). ? e.g, i am from ece background, do i need to prepare computer science and Electrical subject ,etc? Kindly provide your comments, Looking forward your reply! hello sir i have caste certificate of obc .currently i have no obc certificate.can i upload caste certificate of obc in bsnl tta form? sir, i have caste certificate of obc.currently i have no obc certificate .can i upload caste certificate of obc as a proof ? In the application form for TTA , it is asking for total marks obtained by the candidate in graduation. how to fill it whether with the last semister marks or with the total marks obtained in graduation? I have completed my B.Tech. In the result, we don’t get the total number, instead, we get “grade points” & “DGPA (degree grade point average)”. But, in the application form, we are asked to give the total number. how will I fill up the form ???????? The above mention question is for “BSNL JE recruitment form”..
What is eid, can i fill bsnl je without adhar card?????? PS: I don’t have Aadhar Card so does it mean i have to apply for it or what? What extra component in salary will be added in TTA( JE ) Recruitment ? can you share salary structure with me in Percentage term ? how much time will take in training & what is stipend amount during training? 2016 passouts are not eligible for BSNL JE??.. In the registration portal of JE,onlu upto 2015 is given.Will this be the case with JTO also? The selection will be based on all India basis or state basis and in some state there vacancy is less. And I belong to Bihar so please advice me which circle I have to filled. 2016 passing year don’t showing….while filling application.what should I do? I am unable to enter the digit “0” in the aadhar card number field. I am able to enter all the digits except 0. BSNL JTO exam is an exam like GATE & IES. Like you will face theoretical & numerical type questions which will require good knowledge of your subjects. Also there would be three sections in a single paper & you need to clear cut off of all three sections. I would not tell you that this exam is hard but you would require at least 3-4 month hard study, if you will start from scratches. Rest depends upon your subject understanding speed. Both services are good through SSC & through BSNL. BSNL service would be better than SSC service as per our view. Rest final decision is yours. All 7 subjects mentioned in the specilization section. I have been complete B.Tech In Electrical Engineering, can i apply for JE post IN BSNL Organization. You must have completed your course on the date of filling application form. I have completed my B.E. in electrical & electronics stream . Yes you are eligible as Electrical engineering graduate. Because EEE is the sub stream of Electrical engineering.